This is the Maxwell House® Signature blend, beautifully balanced taste. For generations, the flavorful aroma and rich taste of Maxwell House® coffee has brightened up mornings, energized gatherings, and comforted moments. Maxwell House coffee craftsmen, steeped in tradition, carefully blend and roast the coffee beans to the highest quality, as they have for over 100 years. This pride, passion, and attention to detail means that every cup of Maxwell House coffee will be, "Good to the last drop"TM. Medium roasted for a rich beautifully balanced flavor. New easy open "Fresh Seal" can, no opener needed. The unique fresh seal valve allows for the coffee to be packed at peak freshness and protect against oxygen and moisture without vacuum-packing. "No hiss" brings you coffee captured so fresh, you'll want to savor every cup! 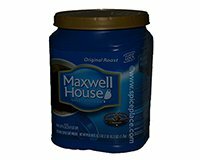 Enjoy the full, rich flavor and delightful aroma of Maxwell House coffee in the Fresh SealTM can. For all coffee makers. Makes 280-310 suggested serving strengths.